Fri. Dec. 12, 2003 - Adolescents, Speedealer, Pistol Grip, Drive by Smile, Supagroup - doors at 8pm. For a good introduction to The Adolescents read Kevin Hillskemper's Tag-Along Adolescent. Recently voted the No. 1 OC band of all-time by the Weekly�s writers and contributors, Fullerton�s Adolescents are not only responsible for one of the most attention-grabbing standout debut albums in the history of punk, but they�ve also become the default, knee-jerk answer to the oft-repeated, mantra-like statement "Nothing good ever comes out of Orange County." Don�t think they don�t share a similar view, either: if there�s any negative aspect of OC life that didn�t get skewered on their self-titled debut, rest assured it was singled out in "O.C. Life" ("714 imbedded in your brain/Designer jeans and malls are all you�ll ever have to gain"), the standout song from lead guitarist Rikk Agnew�s subsequent solo album, All By Myself. Subsequent lineups and releases may not have lived up to the Adolescents� debut, but that doesn�t mean the band was overshadowed by anything else released at the time. And considering their sizable influence and pedigree (members formed or were founding members of D.I., Christian Death, 22 Jacks and Joyride, among others), it�s all the more impressive the band�s "classic" lineup (minus drummer Casey Royer) has recently begun playing reunion shows, sounding great, if not better, than the band�s early gigs. There are two back-to-back shows at Alex�s Bar this weekend, but if you must choose between the two, go Saturday, when the Crowd and the Stitches open. 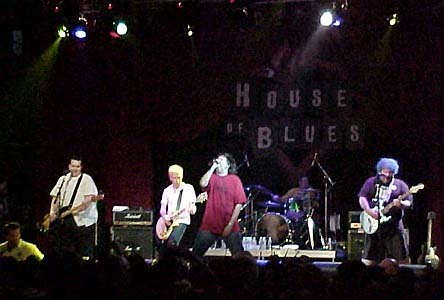 The Adolescents play Alex�s Bar, 2913 E. Anaheim St., Long Beach, (562) 434-8292. Fri.-Sat., 10 p.m. $10. 21+.